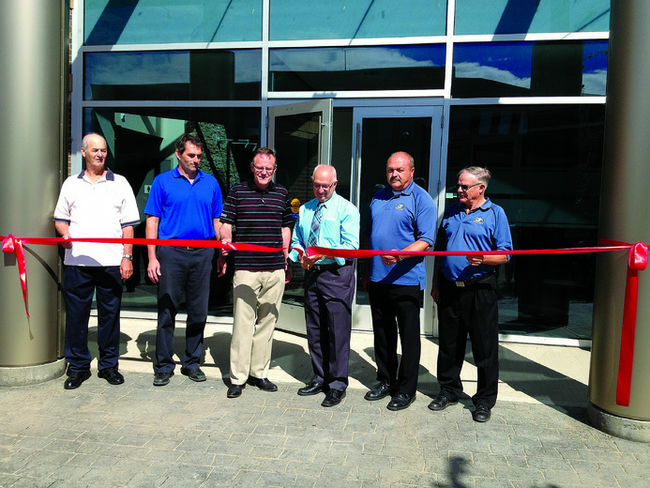 After two years of construction, the MD of Bonnyville new offices officially opened the new offices on Monday August 19. While the council had moved into the building last spring, they hadn’t officially opened the new building until the ribbon cutting ceremony took place. Now the entire staff can fit in the new building, which is four times the size of the original, and they have even more staff than before. Ed Rondeau, the council’s reeve, says the new space will give them the chance to do more and will better equip them to deal with issues as they arise. “The new space will give us a chance to do things like mapping with GPS, so we can better plan for development,” Rondeau said as an example of what the new building will be capable of compared to the old one. Having the entire MD council in house in a big plus, said Rondeau, making communication among the staff easier. The building also was constructed to better accommodate the citizens of the MD, with a friendlier approach to welcoming them to the building. This entry was posted in Cold Lake Sun and tagged cold lake sun, jeff medhurst, New MD of Bonnyville building opens by jmedhurst44. Bookmark the permalink.